The Transport Ministry has agreed to an increase in the starting fare for metered taxi services in light of the recent rise in the prices of liquefied petroleum gas and natural gas for vehicles. Silapachai Jarukasemratana, acting permanent secretary for transport, said over the weekend he would forward the fare hike proposal to the central land transport committee for final approval. The date for the next committee meeting has yet to be scheduled. The flagfall for metered taxi services is currently 35 baht, which covers the first kilometre of any trip. Per-kilometre rates then kick in after that. Mr Silapachai did not elaborate on the details of the rise and said it was not clear whether the fare beyond the first kilometre will also be adjusted. The National Energy Policy Committee recently agreed to raise the LPG price from 19.58 baht per kilogramme to 20.33 baht/kg. The committee late last year also approved a rise in the NGV price by 50 satang/kg each month from January until December this year while decreasing the subsidy by the same amount every month from January to April. The NGV price is now 10 baht/kg, Mr Silapachai said. "It's necessary to increase the starting charge for taxis because natural gas prices will probably go further up as a result of the government's policy to float transport fees for one year," Mr Silapachai said. Songthaew and other types of public transport services that use diesel must wait until the diesel price stabilises before a fare rise can be considered, Mr Silpachai said. He said the ministry also had a plan to re-regulate metered taxis operating in Bangkok after learning that about 20,000 taxis of the city's 100,000 are not formally registered. The way taxi licences are issued would also be reviewed to better screen for qualified drivers, he said. "Many taxi drivers are non-Thai citizens who do not have driving licences. This can be unsafe," he said. Public transport operators are demanding the right to raise fares to help compensate for oil and gas prices. Truckers aren't waiting for permission, however _ they have increased their charges already. Transport Minister Jarupong Ruangsuwan said public transport operators want to raise fares after the retail diesel price increased to 32 baht a litre. He has asked the Land Transport Department to study their costs. The ministry's Central Land Transport Committee would decide if public transport fares should rise. Mr Jarupong said the ministry had to protect both transport operators and the public. Somchai Siriwatthanachoke, director-general of the Land Transport Department, denied reports taxi operators would be allowed to raise fares. He said the operators were receiving a gas discount from PTT Plc and his department would decide if taxi fares should increase when the discount ends. The discount will last until May 16 and he will then ask PTT if it wants to extend it. Vithoon Naewpanit, head of the Siam Taxi Co-operative, said if PTT does not extend the discount, taxi operators will need a 5% increase in their fares. A meeting of taxi operators and authorities including Deputy Prime Minister and Finance Minister Kittiratt Na-Ranong agreed taxi drivers should get help as their fuel costs were rising. Sadit Jaithiang, president of the Pheu Thai Suvarnabhumi Taxi Drivers' Association, said taxi fares had been frozen for a long time although the prices of food, goods and fuel had already increased. He proposed the government extend the service period of taxis from nine years to 12 years to help driver-owners. Witthaya Premjit, head of an association of private bus operators in Bangkok, said operators wanted to raise fares by 2-3 baht because not all of them were eligible for the gas discount from PTT Plc. Sujinda Cherdchai, president of the Passenger Bus Operators Association, said the operators of inter-provincial buses wanted to increase their fares by 6 satang a kilometre. She will file the request with the minister this week. Parinya Rakwathin, general manager of Chao Phraya Express Boat Co, said it would seek permission from the Marine Department to raise fares by two baht. Yu Jianyuenyongpong, head of the Land Transport Federation of Thailand, said truck operators had increased their charges by 3-5%. Prime Minister Yingluck Shinawatra said yesterday she was concerned about increases in fuel prices and the cost of living. Energy Minister Arak Chonlatanon would work out some solutions. Her government will campaign for energy saving and promote alternative energy. 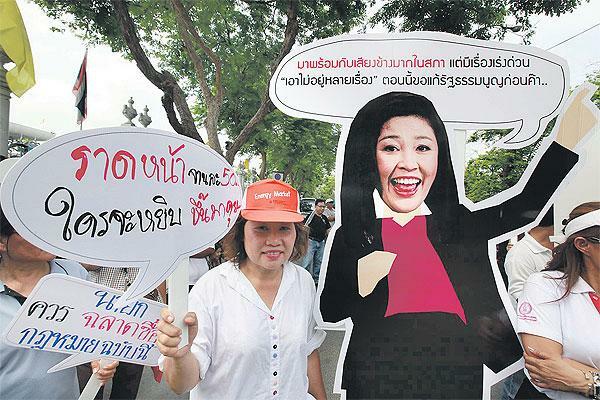 Ms Yingluck said the government had not concluded if it should scrap the State Oil Fund. many also have meters on steroids. Where do they breed all these Thai clowns like Silapachai Jarukasemratana? ^ only here mate, thank goodness. I haven't come across that myself. I get the same journey most days (well, maybe about half the days in a week when I can't be bothered to drive...): to work and back from work, and the cost is always the same, within a few baht. i was told by an ex-taxi driver who now runs a private car business (airport runs etc.) that meters are often tampered with in bangkok taxis. cant say i blame them, the fares have been static for as long as i can remember and represent fantastic value for money. ^ I'm sure that taxi metres are altered in many places around the globe; the other possibility is that it's so wide spread in Bkk that all the taxis I've gotten here have ripped me off! ^ I bet you bloody well did! I also agree that the time for an increase is long overdue. In the last 10 years petrol prices almost tripled yet the taxi fare remained unchanged. no taxis run on petrol, they all use cheap lpg or biogas or whatever it is they put into those big tanks in the boot. or whatever it is they put into those big tanks in the boot. Do you think someone should tell him that there is this land that sits between bangkok, and malaysia, burma, lao and cambodia. That people from this land are actually thai too. or do you think this knowledge might hurt his brain cell too much? Way to write a completely non-informative article. So many words, and yet no mention of the new flag-fall rate and per-km rates. Also, the numbers they did put in are wrong -- 35 baht is the current rate for the first two km, not one. Taxi fare increase in Bangkok is overdue, I hope they make it gradual. The prices definitely didn't keep up with inflation, and cabbies need to put food on the table too. If they don't raise it, there'll eventually be more hassle/scam attempts and we may get into a situation similar to Manila where they always ask for meter fare plus 50 or 100 pesos. As for tampered meters, I've never seen one in 5 years... on only one occasion, I had reason to suspect a meter was running ~30% faster from the airport, but it may well have been my jetlag. If you do encounter this, not much good comes out of challenging the driver, but do down the taxi number and report it -- apparently they do take it seriously, otherwise it would be more common. Deputy Transport Minister Chadchart Sittiphan admitted on Wednesday that it is likely that taxi fares could be raised, following a study that shows a 20 per cent increase in taxi drivers' expenses amid lower income. He noted that there are three choices to raise the fare. 1. While the start-up meter fee is maintained at Bt35, the fare for the further distance may be raised by Bt0.50. 2. The start-up meter fee is raised to Bt40, while the fare by distance is maintained. 3. No increase in start-up fee or fares, but the distance slots - that trigger a step-by-step increase - are shortened. Chadchart noted that the first choice is the most possible, as this send the least impact on consumers. A meeting with taxi drivers and the Land Transport Department would be held, so that a solution could be reached before April 16, he added. If we pay them more will they actually do their fukin job properly? They'll all still drive around like they're Ayrton Senna on speed. Taxi co-operatives are pressing the Transport Ministry to raise fares by up to 12% for trips in the city. Shinawat Haboonpad, adviser to the transport minister, said he would pass the demands for a fare increase on to the minister. If the minister approves the hike, he would forward the issue for cabinet consideration. He said taxi drivers deserved a fare rise in light of the soaring cost of living. Withoon Naewpanich, the head of Siam Taxi Co-operatives, said the starting fare should be capped at 35 baht. But the fare for the first 50km within the city area should be raised by 12%. At present, the first 3km costs 45 baht. If the fare rise is approved, 45 baht will cover a distance of 2.5km. For long-distance travel of between 50km to 150km, a rise of 8% is being sought by the taxi co-ops. Mr Withoon said the cooperatives also wanted the rate for a taxi that is not moving in traffic to go up from the current 1.50 baht to 2.50 baht a minute. A fare increase would help drivers survive the financial crunch and make them less inclined to refuse passengers wanting to travel long distances. This is where they are gonna make there money. You are now going to have taxi drivers wanting to take you in rush hour and rub their hands in glee when they hit heavy traffic. The Transport Ministry has been urged to make its decision on a fare hike for taxis, as the price of natural gas for vehicle is due to increase on May 16. Head of the taxi drivers' rights protection group Somboon Janyalert has given the Transport Ministry a May 16 deadline to approve a fare hike, as taxi operators are facing higher costs. The price of natural gas for vehicle, or NGV, is set to go up by another 50 Satang to nine baht a kilogram on the date. Somboon remarked that if Transport Minister Jarupong Ruangsuwan had chaired the working team tasked with considering a taxi fare hike himself, a conclusion could have been reached much earlier. He added that the ministry could have convened an urgent meeting with the working team to address the rising fuel cost and fare issues, without waiting for taxi operators to file complaints or hold gatherings to press for its action. 90% of the taxi's I've used in Thailand have been fine, it's just that I've still been suffering from PTSD from the 10% that have tried to drop me off at Armageddon when I'm in them..